Lamborghini In Black and David Rand capped the show with the unanimous Park Saddle World Championship victory. 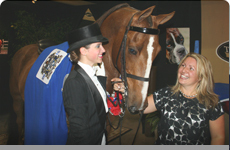 Saturday provided a fitting grand finale to the 2010 Grand National and World Championship Morgan Horse Show. Eight days of fabulous show ring competition came to a close with Lamborghini In Black returning to the spotlight as the unanimous Park Saddle World Champion. The evening also featured rose adorned victory passes for Cingate Starry Night, Treble's First Take, MEM Triple Sec, Leviticus, HVK Bold Spirits, Miz Saturn Star, Grand Cru Beaujolais and SYP HIgh Definition. The final AMHA Gold Medal of 2010 saw Oklahoma's own Sascha Mills earn the Hunt Seat top prize, while Saddle Seat Equitation World Championships were earned by Michaela Gillispie, Hannah McBain, Kristina Mauro and Kelsey Robinson. From the previous Saturday's In Hand World Championship pose in the winner's circle to the final spotlight victory passes eight days later, the 2010 Grand National and World Championship Morgan Horse Show was a great showcase for the extraordinary beauty, versatility and athleticism of the Morgan breed. For complete coverage of the 2010 Grand National and World Championship Morgan Horse Show, we look forward to brining you the November 8 edition of The Saddle Horse Report. Merriehill Home Stretch capped the night as the Park Harness World Champion to the delight of Team Merriehill. 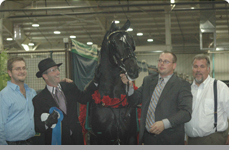 The Grand National and World Championship Morgan Horse Show hit the homestretch in a big way on Friday with four-year-old Merriehill Home Stretch capping the night as the Park Harness World Champion. It was a record-setting night for Bada Bing as he became the first four-time English Pleasure World Champion, while Dragonsmeade Carnegie Hall tied the record in the Amateur Pleasure Driving World Championship with four consecutive victories. The evening also featured repeat world championship victories for Dragonsmeade Icon, Treble's Tanqueray, L'Cima Exclusive, MEM Bailamos, SYP Show Stopper and Fait Accompli. In addition to three sessions of world championship competition in the coliseum, several Equitation World Championships and the UPHA Challenge Cup Finals took center stage in the performance arena. The sport horse competition featured the exciting Reining World Championships. The final day of competition at the Grand National and World Championship Morgan Horse Show will take place in Oklahoma City on Saturday, October 16. Helen Crawford and Cry Baby earned the Ladies Park Harness World Championship under the direction of Robert Hughes. As the Grand National and World Championship Morgan Horse Show heads into the homestretch, a number of world champions were crowned on Thursday. It was a pair of lucky sevens during the evening session as the legendary Festival Calypso and Stephanie Connor earned their seventh Ladies Pleasure Driving World Championship, while Helen Crawford added her seventh Ladies Park Harness World Championship as Cry Baby took over the reign of her dam six-time winner HVK Ancient Cry. No Contest, Optimus Prime, GLB Leader Of The Band, CBMF Momentarily, SLB Puccini, Lookaway's Hot Ticket, Cedar Creek Flambeau, Med-E-Oka Nobel Prize, L.A. Ricochet, HVK Brass Ring, Graywood's Arthur, Cabot Carte Blanche and She's My Calendar Girl carried home world champion honors to add to a great day of competition in the coliseum. The performance arena featured a exceptional morning of competition with Hunt Seat Equitation World Championships won by Senior Champion Olivia Lahr, Junior Champion Ellery Walker and Walk-Trot Champion Brooke Perlee. The sport horse competition featured the Trail World Championship competition as well as the start of the always-exciting reigning classes. The Grand National and World Championship Morgan Horse Show is taking place in Oklahoma City through October 16. Michaela Gillispie was crowned the AMHA Saddle Seat Gold Medal Finals Champion aboard The Wizard directed by Suzanne Haberek. Day five of the Grand National and World Championship Morgan Horse Show got off to an exciting start as a 5.1 magnitude earthquake struck the Oklahoma City area at 9:06 am. The sizable quake did not cause any damage, but certainly was a topic of conversation throughout the day. The show ring action featured Grand National Championship victory passes by some of this season's top champions including; City Kitty, Treble's First Take, Skywarrior, NDT French Impressionist, Uppercase Innovation, Graycliff Tony, CBMF Restless, GLB Leader Of The Band, Total Request, The Noblest and SYP High Definition. A number of World Championships highlighted the schedule as Boogie Nights, Fox Hollow Talk About Me, Meadowcreek Bay B Fe, MEM Gentleman Jack, Narragansett Spirit, Indian Creek Bali Hai, Cherrydale Acappella, Hylee's Fanflaire and Armada Line Drive carried home the roses and tricolors from Wednesday's competition. 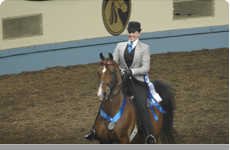 The AMHA Saddle Seat Gold Medal Finals were the evening's grand finale as Michaela Gillispie earned the prestigious honor directed by Suzanne Haberek. The sport horse competition featured the awarding of the High Point Hunter/Jumper World Championships in the coliseum. The Grand National and World Championship Morgan Horse Show is taking place in Oklahoma City through October 16. 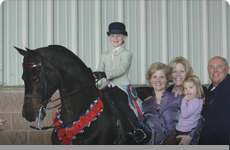 Six-year-old Kira Gendjar and Gradell's Wild Reflection celebrated their Walk-Trot English Pleasure World Championship victory with their proud family. The Grand National and World Championship Morgan Horse Show reached its midpoint on Tuesday with another full day of show ring competition. The 2010 AMHA Western Seat Gold Medal was awarded to Madison Wurster aboard Evil Knievil. Kira Gendjar and Gradell's Wild Reflection paired up to earn the Walk-Trot English Pleasure World Championship, while Brooke Perlee and She's My Calendar Girl took home the Walk-Trot Hunter Pleasure World Championship. The young horse competition featured a trio of World Futurity Championships with victorious performances by Merriehill Black Betty (Three-Year-Old Park Harness), SpringMill Superstition (Two-Year-Old Park Harness) and RCV Patent Pending (Three-Year-Old English Pleasure). Such world titled performers as Indian Creek Bellagio, Nicoria, PLS High Pine Picasso, RWJ Commanding Topic, EKL Assets Vision, Miyake, Queen's Starfire, Briar Oaks Pep In My Step, Dragonsmeades Infusion, MEM Bailamos and CBMF Crown Prince visited the winner's circle in Grand National Championship competition on Tuesday. The sport horse competition featured the start of Hunter/Jumper and Trail classes. The Grand National and World Championship Morgan Horse Show is taking place in Oklahoma City through October 16. It was a great night for Cingate Starry Night and Whitney Bodnar as they topped the World Champion Futurity Three-Year-Old Pleasure Driving. It was a memorable Monday as the Grand National and World Championship Morgan Show was in full swing for the third day of competition. 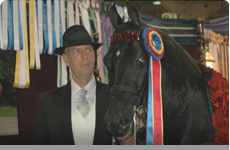 Several of the breed's top winning champions vied for Grand National titles on Monday with Festival Calypso, Dragonsmeade Carnegie Hall, Bada Bing, Boogie Nights, Treble's Tanqueray, CHMH Spice Town Girl, Fox Hollow Talk About Me, NDT French Impressionist, Dragonsmeade Carnaros, MIZ Saturn Star, QVM Jocelyn Rose, No Contest, Cherished Assets and other notables starring on victory lane. The Monday evening nightcap featured Spiceolife Present Tense besting a competitive field to capture the Park Harness Stallions. 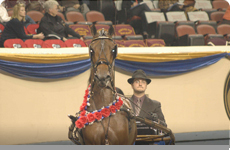 The sport horse competition featured the Carriage Pleasure Driving World Championship along with the parade of Dressage World Champions in the coliseum. The Grand National and World Championship Morgan Horse Show is taking place in Oklahoma City through October 16. Daisy Beisler and Graywoods Arthur celebrated a trip down victory lane as the Grand National Junior Exhibitor English Pleasure 16-17 Champions. The second day of competition at the Grand National and World Championship Morgan Horse featured an outstanding array of classes in all three rings. Grand National Championships were awarded in the performance division in a number of large and competitive classes. In the equitation division the first world champion was crowned as Oklahoma's own Paige Crowley topped the Walk-Jog Western Seat Equitation World Championship. The sport horse competition featured athletic performances by the dressage and carriage entries. The Grand National and World Championship Morgan Horse Show is taking place in Oklahoma City through October 16. Dragonsmeade Icon capped the first day as the World Champion Stallion. 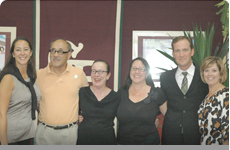 The Fu Family celebrated with Tim and Kim Roesink. An exciting first day of competition at the 2010 Morgan Grand National and World Championship Horse Show is in the books, with three new In Hand World Champions crowned. Dragonsmeade Icon now reigns as the World Champion Stallion after an incredible round of competition among the aged stallions with Tim Roesink presenting for the Fu Family and Dragonsmeade Farm. The World Champion Gelding will once again reside at Tara Farm as CBMF Avenger proudly wore the roses with Ken Swanson on the lead. It was a unanimous victory for Flawless as World Champion Mare with Keith Nelsen directing for owner Sarah Lee. The first day also featured numerous Grand National Champions pinned from the equitation, performance and sport horse divisions. The Grand National and World Championship Morgan Horse Show is taking place in Oklahoma City through October 16. Results and judges’ cards will be posted online as they become available.